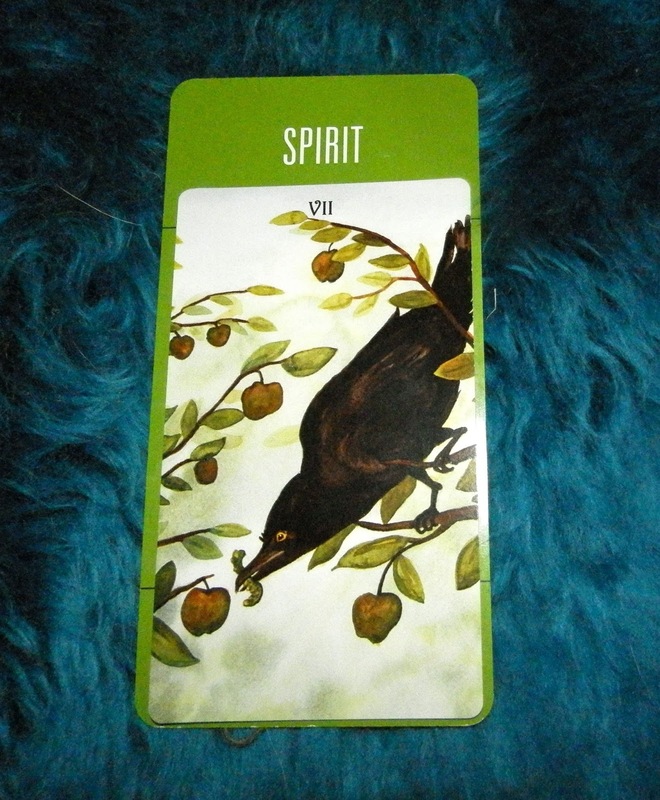 Today's Draw: The Seven of Crows (Pentacles) in the Spirit position from the Badger's Forest Tarot and the Deck of 1000 Spreads. Are you waiting for something to arrive in your life? Does it feel like you've been waiting forever? Is it time to spend your time more productively? First I want to say that my life has been one, big, profound spiritual lesson the past few weeks, but for some reason neither the cards nor the clock are cooperating with me sharing those insights with you. I suppose it will all find its way into the daily draws eventually, but I want to write it all down and I just don't have the time! Anyway, in a way, that's what this combo is about. Spirit is telling us to be patient and persevere and the lessons, resolutions, information—whatever it is that you're searching for—will come naturally and without added effort. After all, this crow found his dinner without even leaving his branch! Sure, he had to lean forward and stretch his neck out—he had to "put out a hand" to receive. And he had to have some patience. But the universe brought his desire right to him. And it will do the same for you. Right now, Spirit just wants you to know that your order is placed and they're preparing it in the kitchen. Depending on what you asked for and how prepared you are to receive, it may take more or less time than you'd anticipated. But when it comes to the universe, all you're in charge of is the "what" anyway. The "when" and "how" are up to the universe. And if you're putting out effort to hasten the when and dictate the how, you're not being very gracious. Would you like it if someone asked you for a favor then told you how to do it and when? So now is the time to be patient. And if you're impatient with being patient, spend some time making sure you're ready to recieve. If what you ask for calls for a more mature version of you, start working toward that. If it calls for someone more experienced than you, then get the experience. And if it's a super hot, red sports card, ferchrissakes, clear a spot in your garage. You won't receive what you asked for until you're ready to receive it anyway. So spend the time you're spending kvetching about how long it's taking getting ready to greet your wish when it comes.